It's been awhile since I did a Fabric Friday. I've decided to rotate my Friday posts out and I have some fun ideas for Fridays around here. But I do love talking about fabric, so I'll be featuring a Fabric Friday every month. Today I thought we could take a closer look a woven rayon fabrics. 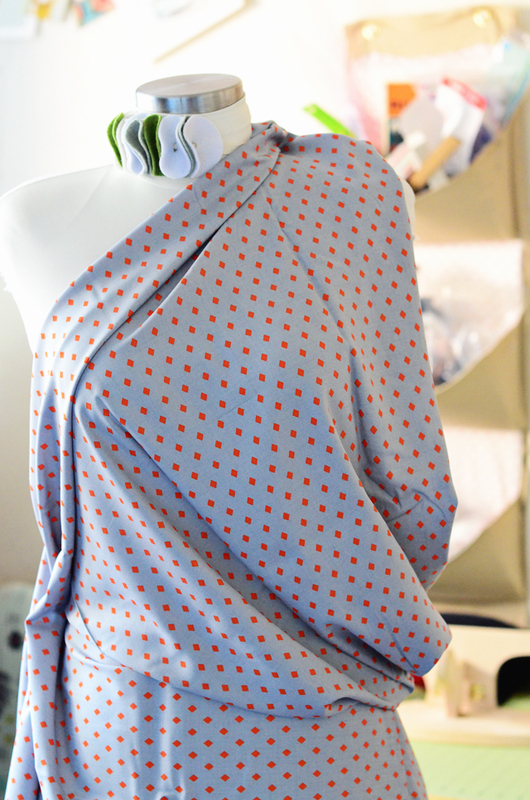 I love the drapey look of them, which reminds me of silk, yet they are fairly easy to sew with. I mean, it's not quilting cotton by any stretch but as compares with other harder to handle fabrics, they are pretty nice. Rayon. This is such a misunderstood fiber. I don't know why, but I do believe that rayon and polyester have flipped roles in a lot of people's minds these days. Polyester has a place, but I'm telling you, it's plastic. It is plastic. Polyester doesn't breath well and it is purely synthetic, unless mixed with other natural fibers. Rayon is not the same thing. Rayon is a cellulosic fiber and it's roots are based in nature - tree pulp. Rayon, lyocell, acetate, triacetate, viscose*, modal and bamboo are all made from regenerated cellulose. These are considered semi-synthetics. Rayon is the oldest manufactured fiber. It was known as "artificial silk" when it first appeared on the market in 1889 and it gained popularity as it was economical, comfortable to wear, breathable and versatile. *Viscose is technically a process that rayon goes through to become a fiber/fabric, however the fabric is usually referred to as rayon in the U.S. and viscose in the United Kingdom. Rayon is the fiber type here and then there are weaves that rayon fibers can be woven into to create different fabric types. Rayon Challis is one such fabric. It's your basic plain weave. Rayon Challis is very drapey. It's a thin fabric. Rayon usually has a cold touch to it, which warms up immediately with your body heat and it's soft to wear - feels wonderful, honestly. Rayon Challis makes great dresses and tops, or even flowy skirts. Also think pajamas. This fabric would make lovely pajamas. I had a couple of other types of rayon wovens that I thought I would show you too. They are very similar to rayon challis except the weave is just a bit different, however the characteristics stay the same - cold to the touch (warms up immediately though) comfortable, light and flowy, drapey, etc. The dotted fabric is rayon sateen. It has a satin weave as opposed to a plain weave and so one side has a sheen to it and the other side is dull. Also have a couple of pieces of rayon twill (pictured below), which has a twill weave instead of a plain weave. Kind of like denim and gabardine but not stiff or thick - it's got the same hand as the rayon challis and sateen. There are other types of rayon wovens out there too. 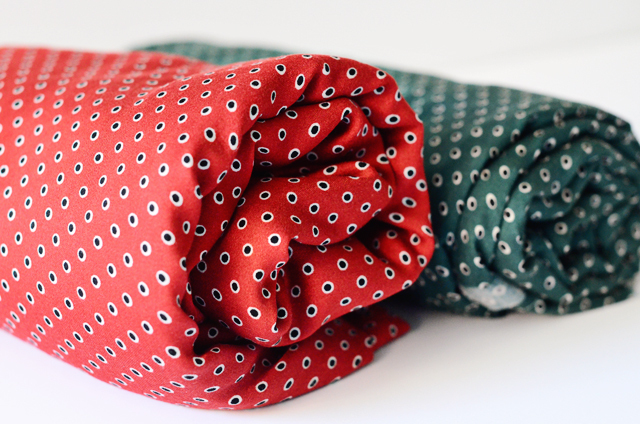 Rayon poplin, rayon batiste and rayon voile + more - just don't let the rayon bit turn you off! Rayon is a pretty wonderful fabric. I use Bemberg Rayon lining for most lining projects. It's 100% rayon fabric that feels wonderful to the skin and has longevity even though it's marvelously light and thin. Do you have rayon wovens in your stash? Anyone have any of that cold rayon from the 40s? Gosh how I would love some of that! Rayons are fairly easy to locate - I see them at Joann and Hancock these days, but here are a couple online sources too. i adore rayon! maybe it became unworthy when the need for an inexpensive replacement for silk went away, and the stigma stuck? Thank you so much for fabric Friday's. I have enjoyed sewing for years, but never had such great tutorials on fabric. I am learning things that I should have known all along. Fabric Friday's are greatly appreciated! How is rayon to sew with? Does it ravel? Maybe you could add sewing tips to yourfabric Friday. Thanks, I enjoyed your post. Thankyou Sunni for such a wonderful tutorial about Rayon. I've always loved Rayons, but can never find nice patterns in our box stores. It is a wonderful fabric that breathes and looks great. Do you have any fabric source suggestions. I so miss your online fabric store. I still have stashes of gorgeous wool that I purchased from you. Have a great one, Sunni. I too like rayon, and acetate and do not understand why we do not see more of those fabrics. As a polymer engineer and sewing enthusiast I can say Rayon is one of may favorite fabrics to wear. I find it soft, very drapey and color wise very exciting. I really like tencel garments and there is one brand of knitting yarn call Handmaiden Sea Silk made with lyocell and seaweed. Beautiful pictures! Hurrah for rayon! Last summer, it was my go-to fabric for dresses after I had seen the Alder dress in rayon by Sew Busy Lizzy. The drape is incredible, but it creases a lot. Not a good choice for travels, but still one of my best fabrics. And those prints! I love rayon as well! It is SO comfortable in the summer, even more so than cotton and silk, in my opinion. I don't know why it fell out of favor either. Perhaps polyester was cheaper at the time? I LOVE rayon (or viscose, since I am a Brit!!). It's fast becoming my favourite fabric to sew with and wear. Yes it's not as easy to sew with as cotton, but it's not that bad either, and it's just divine to wear, particularly the Cotton+Steel stuff. I just wish it wear more widely available, particularly in solids! Sunni - So happy you are back posting on a regular basis :-) - Really enjoy reading your informative posts. Thank you. Rayon is my favorite fabric, especially for skirts because it hangs beautifully. 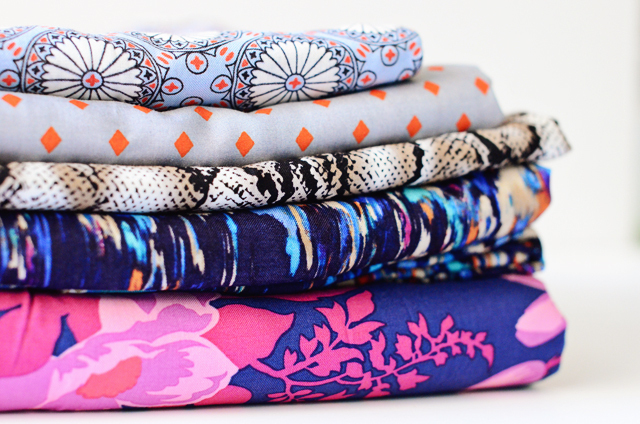 I have tons of rayon stash...beautiful prints that I had to have! Thank you for the info on rayon...most of which I didn't know even after wearing it for years! I love rayon. Part of the reason that I believe people are turned off by this fabric is that back in the 90s when it seemed to be gaining some popularity it would shrink like a man in cold water. The texture was also so different from today. I have a small collection of sueded rayon, which someone told me no one is making anymore. It's so soft and cool, with that brushed texture. Ahhhh....love. I generally like rayon fabrics, but I can tell you why customers would tend to be turned off - it used to be fairly awful stuff. Rayon fabrics have definitely improved over the years, for the most part. The stuff that used to be available in the early 80s for example, shrunk horribly, was often very ravelly, sometimes pilled, and was not durable. The earlier rayon, such as that from the 40s, has a tendency to absorb body odor that is unremovable. Some weaves can also have an odd kind of inflexibility at times, but I don't know why. In my recent experience there seems to be vast differences in rayon quality. I suspect this is because it can be a fairly cheap material that lends itself to the low-end export market. I was disappointed by some rayon challis that I bought online awhile back - it seemed a lot like that old 80s stuff. Oh, well, you get what you pay for sometimes! On the other hand, modal, which I love, is often rather pricey, comparably. In (slight) defense of polyester, when woven to be breathable - like for exercise gear - it is superior (IMO) to natural fabrics because it dissipates moisture quickly. At least this is my experience, as someone with sensitive, rash-prone skin. Thanks for the fabric review! Rayon is my favorite fabric! I'm so glad it's making a comeback. I actually have a couple of the prints you have pictured! Joann's usually has some in not-terrible prints and I like that I am able to find dresses and pajamas made of rayon at target and gap now. I also have a small stash of vintage 40's rayon. It's so wonderful to work with. I have a royal blue piece with firework print I'm saving for a special occasion. I'm being drawn to rayon and rayon blends lately because it sews beautifully. I love its drape. In the past, I avoided it, remembering the cheap renditions in rtw. But now, I have a different perspective and it's at the top of my list and in great company with my natural wovens. I would say I've been afraid to use rayons in my sewing because of the time, long ago, I bought a rayon top. The first time I washed it, and I had it set to cold, it shrank like nobody's business! What are you tips for laundering rayon? Thanks! I've not been super impressed with the challis I've gotten from Joann fabrics (it goes off grain if you look at it sideways) but other challis I've found is wonderful. It is kind of a unicorn fabric though--it is hard to find the right weight in challis with a good print at a decent price point. That sounds so marvelous! I was thinking I could get away with a drapey button-up shirt to wear under a cardigan. Sigh... I love rayon! Aww! Thank you Sharon! So glad to hear. Thank you - this a great idea! I will most definitely try to do this in the future! I think rayon is fairly easy to sew with. It's got some grip to it which helps it not to slide around too much. It does ravel, so french seams or a serger is nice. Oh thank you Amy! I just updated with some online places that I look for rayons. They are few, but as I go along I'll update more. Thanks so much! It's such a good question! These days they are good fabrics! It's nice to see Gertie doing some in her fabric line at Joann - they are pretty cute! Oh thank you! And how awesome that you sew and you're a polymer engineer - it's just too cool! Agreed! We need more rayon in our lives - hopefully a fabric manufacturer reads this! Thank you for this! I keep wondering about it actually and so it's nice to hear some concrete info on why it fell out of favor! Thank you JenL! And I was going to add that I do think polyester has a place - you are right, it does well in active wear with moisture wicking. And though I've been more of a snob in the past, I've been finding some cute polyester prints that would work as cute tops or even a fun lining. I like it woven with other fibers especially in ponte knits and I'm a fan of it in coatings too. It does have a place. I LOVE rayon (Well viscose being another brit) it is def my go to fabric for tops etc and I can normally pick it out in the store by feel, it feels so much softer than cottons. 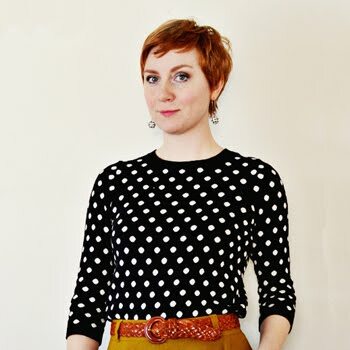 I am finding a lot more RTW clothes are being produced in Viscose and im all for this. Do you have any good links for places to find it in the UK? I do believe that it's a shrinker. I've always had it shrink for me, so I would say purchase extra yardage if you can. I have found though that the newer rayons don't shrink as badly as some of the older ones in my stash. I do like good-quality rayon - breathable, silky, and nice to work with. However, my experience has been that the quality varies WIDELY. It's hard to know when I'm buying a piece of rayon challis (and I see this a LOT with rayon knits, as well) whether or not it will start to pill after just a few washings. A lot of the rayon clothing I buy I have to wash on delicate and hang dry because it doesn't hold up as well as cotton (and I've started avoiding it altogether in clothing stores). I've started to shy away from it in the fabric store for the same reason - I have to baby it and I never know how long it is going to last. The exception to this is Bemberg, which I will always choose for lining and always holds up well. Maybe it's because I already tend to "baby" my lined garments? I am not a big fan of rayon. It can shrink horribly and the quality is all over the charts. I am afraid I associate it with cheap clothing. I do appreciate a hefty quality rayon knit though and do use bemberg as a lining. Well I'm just adding to the love-in here. Rayon is the best. Just the best. I live in Sydney Australia which can be really humid for a lot of the year. Rayon copes with this perfectly. The woven stuff that is. I don't think I've ever sewn with rayon knit. I wash it and put it in the dryer before I sew it though. I assume it shrinks because of my experiences with rtw in the 80s and 90s. I've made dozens of Scout tees as well of lots of other cool loose tops. It's readily available in Spotlight at the moment. Also great for pjs. I love rayon. It's a pity it's quite difficult to find in Belgium, however, suppliers are starting to stock up on lovely rayon wovens again, which is good for my budget, since silks are not! Thank you for sharing this great knowdledge! I also love the fact that you added wovens. Often people mistake the fibre for the fabric name, which can cause a lot of confusion, especially when buying fabrics online! I just bought a pile of gorgeous rayons from Harts Fabric last friday. They had one called a peachskin, which is sort of brushed on one side, and I love the heavier weight of the twill. I live in hot, humid Houston, TX and am very fond of rayon challis. I make all my nightgowns with it as well as tunic tops. Yes it shrinks but I always pre-wash my fabrics before sewing so it's never a problem. Hi from 'Down Under', Sunni! This post is so timely for me and I thank you so much for your generosity in sharing your knowledge with us. I have two pieces of rayon that were brought back from a vacation in Vietnam by the owner of my favorite local (very small) fabric store. I have hand laundered both pieces in cold water and line-dried them in the hot Aussie sun and they both had minimal (if any) shrinkage. The one piece that has a bright orange colored flower on it (laundered separately) did lose a tiny bit of color in the laundering water but unnoticeable in the actual dried fabric. I have had concerns about the fabric creasing, but then linen creases and linen is certainly not a cheap fabric. Tomorrow I will cut one piece of my rayon to make up Butterick B5997. Wish me luck as I embark on my very first experience with rayon! I haven't sew much with rayon since the 90s and I admit I'm kind of scared because so much of it shrank in the wash back then, even hand washing. I do have some rayon crepe which i haven't used yet because it's really springy and I'm not sure what it would be best for. Probably a dress or a pull over woven tee. I want to wear more rayon and if you all are saying that the shrinkage isn't so bad anymore (and I can pre wash/dry) then I definitely need to try it again. I quite like rayon actually. I've found it breathable and comfortable when you can get your hands on a good batch. Sunni, great post. I'm getting to know the more modern rayons, and like them a lot! Wrinkles! I made a lot of clothes in the 80's and 90's, and ended up giving them all away because they wrinkled so badly. But I just bought a piece of rayon that doesn't seem to wrinkle. Has something changed? Love Rayon. Thank you for sharing. Sometimes it is hard to find a rayon instead of poly fabric. Lovely in summer heat (Rayon not poly). What a great post! 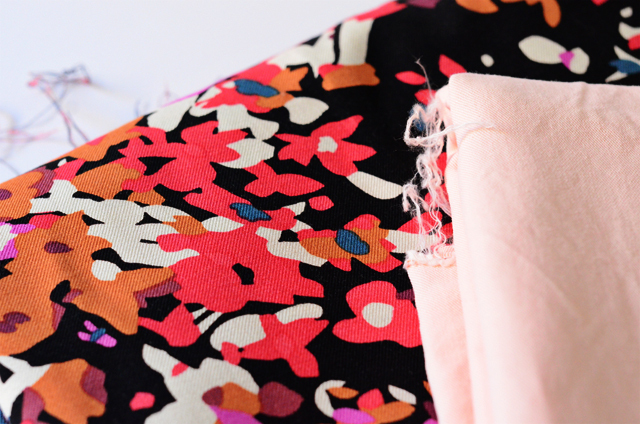 I love rayon & think it is my favourite fabric to sew & wear aT the moment! Here in Australia it is good for,our summers. I just picked up some dreamy printed rayon in Helsinki (what a great souvenir!) and the quality seems to be a lot better than our chain stores that we have- it really is a lot closer to the "imitation" silk. I just made a summer maxi (Southport) dress and it is beyond perfect! I'm just making the Oslo (Tilly & the Buttons) out of a gorgeous batique rayon woven that I picked up as a remnant from our local fabric shop. It's fabulous to work with and drapes like a heavy silk. Thank you for posting such a helpful blog! I have 4 yards of rayon from the 40's I think. It's navy blue ground with pink/red/green rosebuds printed on it. Small scale print. my husband got it for me at Brimfield Antiques market but it's not my thing. Want it? Really, just send me your address and it's yours. I've always loved rayon and am happy to see it is back in favor but, being a life-long environmentalist did a little research on the environmental impact of this wonderful fabric. To beat that pulp into a fluid fabric uses a lot of water and chemicals, as well as the raw material - trees. This year alone, 70-100 million trees will be used to produce rayon. Some of those are old growth trees while some are beech and eucalyptus. Lyocell (aka Tencel) is considered the best choice in terms of environmental impact (less water, 98% recovered chemicals, plantation trees), followed by modal. Every fabric has its upside and downside, and I will still buy rayon, but now I look for these two types. Rayon challis may just be my favorite fabric ever. I have a handful of dresses I've made from it that get tons of wear, and several more pieces in my stash. Thank you, Sunny, for this informative post! I love rayon. I sew a lot of 40ies-style dresses and it is the perfect fabric for those. At the moment it seems like rayon is becoming more popular again as I seem to find more rayon prints in the fabric stores but for my taste it is still way to little variety. All the nice prints are jersey nowadays (unless you are specifically looking for a jersey with a nice print of course. In this case you will not find anything :-) ).